The Eighth Judicial District Commission on Judicial Performance unanimously recommends that Judge Cindy Wilson BE RETAINED. Judge Wilson received her Bachelors of Science in Accountancy from the University of Illinois in 1977. She was previously the owner/operator of the Shamrock Ranch and a CPA with Tredway, Henion and Kerr. She presently serves as the county court judge out of Jackson County in a 20% part-time position presiding over the county court in Walden. She also maintains a private practice in Jackson County as a certified public accountant. Judge Wilson is a past school board member and is active in volunteering her time to community organizations. Judge Wilson was appointed to this county court position in December, 2010. Her caseload consists of 10% Civil, 17% Misdemeanor, 70% Traffic and 3% Small Claims. Because she presides in a relatively remote setting and on a part-time basis, Judge Wilson is often called upon to address matters outside of regularly scheduled court settings. Judge Wilson and her staff communicate frequently. She maintains a flexible and responsive judicial practice so that motions and other court matters can be addressed as they arise rather than being forced to wait solely for the regularly scheduled weekly court date. The Commission reviewed evaluation surveys regarding Judge Wilson’s performance, written samples of Judge Wilson’s rulings, and the Judge’s own self-evaluation. In addition, the Commission personally interviewed Judge Wilson, interviewed a representative of the District Attorney’s Office, and conducted an in-person observation of court proceedings. Of all attorneys surveyed about retention, 80% recommended retaining and 20% recommended not retaining. Of non-attorneys surveyed, 85% recommended retaining, 8% not to retain, and 8% made no recommendation. (These percentages may not add up to 100% due to rounding.) Attorneys and non-attorneys score Judge Wilson higher than the average score of all the judges up for retention in the following categories: Case Management, Application and Knowledge of the law; Communications; Demeanor; and Diligence. Judge Wilson is passionate about her judgeship and has completed 250 hours of legal education since her appointment with an equivalent amount of additional informal training. 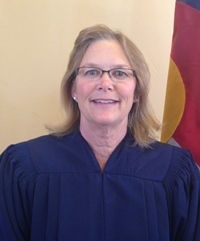 She frequently travels to neighboring counties to observe county court proceedings and utilizes all available tools to support continued professional growth as a citizen judge. Judge Wilson impressed the Commission with her insight into the specific needs of Jackson County citizens and the creativity with which she has addressed the community challenges and limited resources available in her jurisdiction. Judge Wilson prides herself on her meticulous legal research so that she may be fully prepared to address the issues before the Court. She is particularly careful to explain the judicial process thoroughly in lay terms to the many self-represented parties in her courtroom and makes certain that each litigant is heard. Judge Wilson treats every person with respect and dignity. The Commission was impressed with her sense of fairness and efforts to maintain the trust of the community.